Meadow Fabric Ball is a soft plush ball made of fabrics of different textures. 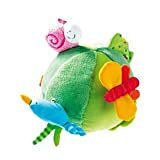 The green ball has soft colorful toys surrounding it, and these toys can be moved by pulling objects on the opposite side of the ball. The toys include a butterfly, worm, snail, bird and flower. The toys make noises, such as the squeaking flower, the rattling snail, and rustling foil butterfly. I like this toy because of the various objects that the baby can grab, clutch, and move. The ball is also a nice size for a baby to hold. The noises keep a young one entertained. All-in-all, this is another wholesome, simple, natural cloth toy that young babies seem to enjoy and is easy to clean (just throw it in the wash).